The Mathical Book Prize is an annual award organized by the Mathematical Sciences Research Institute (MSRI) with an aim to “inspire a love of mathematics in the everyday world in children of all ages.” We previously highlighted some of their selected titles that introduced children to the principals behind counting. In another look at books awarded the Mathical Book Prize, we focus on three books that go beyond one-to-one counting. These books provide compelling contexts that help primary grade children understand why more advanced counting is useful and that it isn’t always efficient to count by ones. Sheep Won’t Sleep (2018 Winner) brings a colorful and creative twist to the dilemma of what to do when counting by ones doesn’t work. 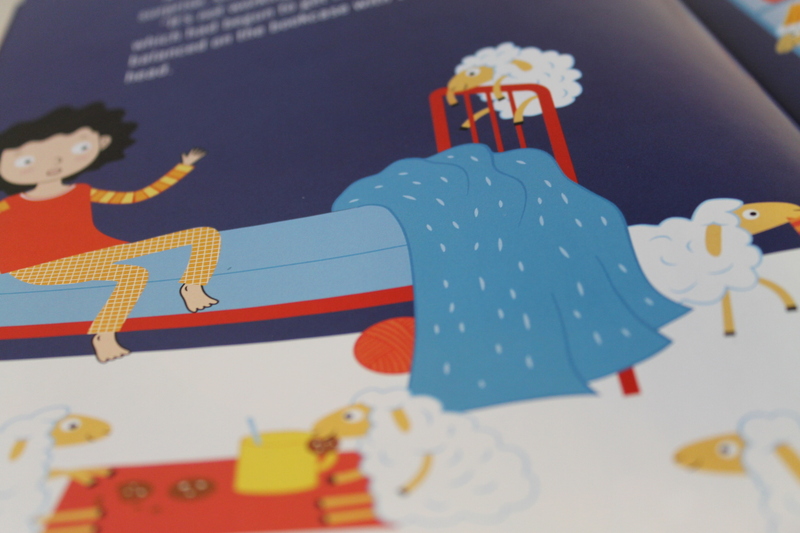 When she tries counting sheep, Clarissa’s eyes pop open to discover 10 wooly sheep crowding into her bedroom. So she tries counting alpacas by 2’s only to have 20 of them join the sheep. When she switches to counting llamas by 5’s, 20 more wooly critters show up; counting yaks by 10’s brings another 50 creatures. When she counts them all back down, rolling all their wooly threads into a ball, Clarissa finally gets to sleep. Besides the pictures of ever-increasing groups of wooly animals, this book invites questions about how to select the most efficient “friendly” number for skip counting. Create a large classroom chart (that might be fun to share on a classroom bulletin board) about what collections might be best counted by 2’s, 5’s or 10’s. An easy place to start is to figure out how many body parts in total there are in the classroom. It’s easy to count eyes and ears, hands, and feet by 2’s, for example. In the same way, counting how many fingers or toes calls for counting by 5’s and might also be done by 10’s. It might be fun to have groups of children work on illustrating the chart as well as writing out the counts. 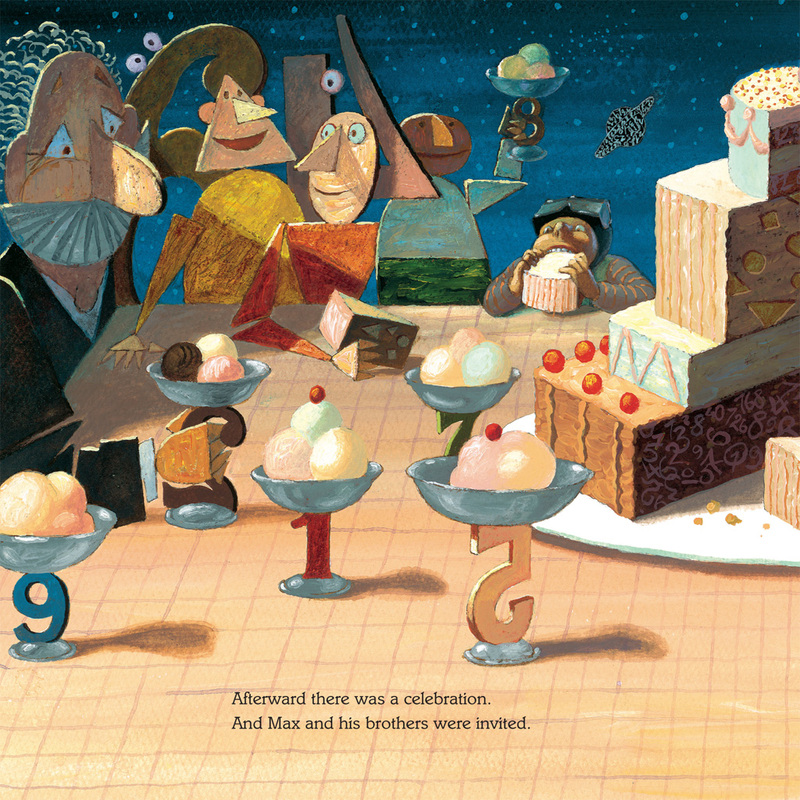 The idea of counting sheep to get to sleep comes up again as a way to end a busy night described in Max’s Math (2016 Winner). Max and his brothers travel though Shapeville and Count Town, passing many sets of things to count such as five clouds, two buses, four triangles, and one square. They find numbers everywhere they look! Have your students look for everyday collections of things that come in equal sets (i.e. pairs of shoes, boxes of crayons, packs of trading cards) to make their own counting stories. One Big Pair of Underwear (2015 Winner) is bound to appeal to 5- to 8-year olds who think just the word underwear is hilarious. However, they are virtually sure to be willing to continue through the book, playing with the idea that when you have an even number of objects and an odd number of critters who want them, it just isn’t fair! For example, if you have 4 large jars of candy bars and 5 greedy goats in red cars, there’s nothing left for the 1 goat who drives up to find 4 empty jars and no candy bars. It isn’t until 20 pigs decide to go piggybacking and take rides on 10 slides that everyone else decides that sharing might be the way to go. The final pictures show all kinds of sharing and swapping going on that kids can have a grand time putting into number sentences. Once they have done that, many might love to pair up with a classmate and think up some fair share tales of their own that push mathematical thinking into more advanced counting and beyond one-to-one counting. What Kind of Counting Book Is It?